And, anyway, I've been looking for an excuse to learn some basic electronics for a long time. So, I built my own! 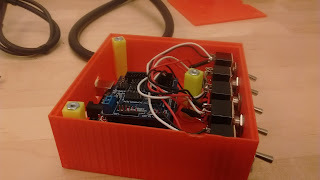 Several other people have built similar things, but I decided to jump in head-first and not follow any guides, in hopes of learning about electronics and wiring along the way. Wire! 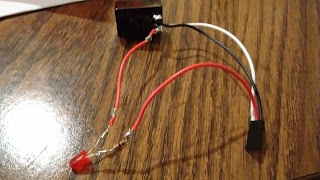 Stranded, 22 AWG wire is perfect for general hobbyist electronics work. 3-pin dupont connector housings combined with the sensor shield make it possible to wire each switch in a modular way. Female dupont connector pins or else the housings are useless. Some LEDs, and accompanying LED holders. Toggle switches, the satisfying clicky heart of the project. A soldering iron, and several accompanying accessories. Some nuts and bolts for binding everything together. A breadboard, with jumper wires and these really useful jumper/alligator clip wires. pinMode(13, OUTPUT); // this is the Arduino's on-board LED. 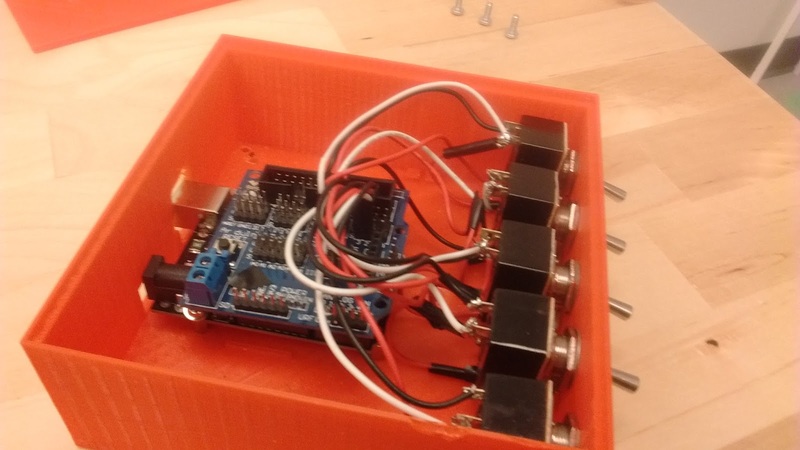 This is just the design from the breadboard realized in a way that lets it interface with the Arduino sensor shield. 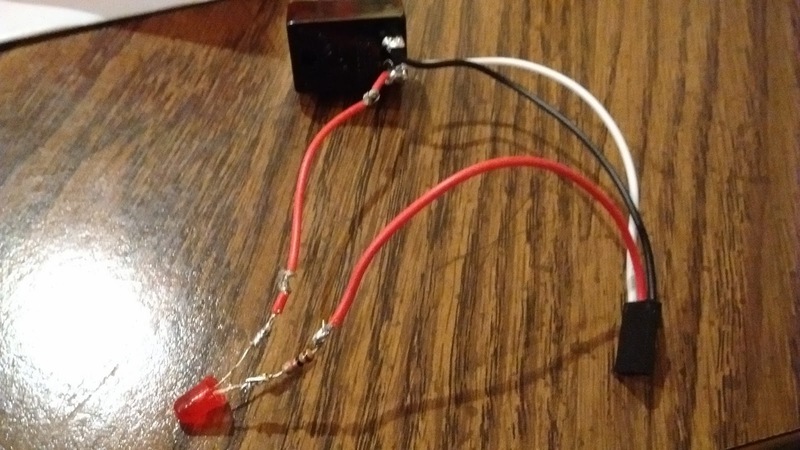 The red wire is connected from 5V through the LED setup and onto one of the switch posts. The LED has a resistor in series with it; I used 1kΩ resistors for my red and yellow LEDs, and 10kΩ for blue and white. Strip the end of your wire. Lay the wire onto the 'open' part of the dupont pin, and push it in a bit. Ideally you want the bottom of the pin to be flush against your wire casing. Fold the metal flanges on the pin around the wire with needle-nosed pliers, so that it's semi-closed. Crimp those flanges down with a crimp tool. Be careful not to crimp the 'top' half of the pin, where you don't have wire. You'll need that to mate the pin with the headers on the board. Using the pliers again, squeeze the metal that was flattened by the crimp tool into a rounder shape. Insert the pin into the casing. (For this project, I hade to make sure the voltage line was in the middle, to match the pinout on the shield) There is a correct orientation but it's a bit hard to describe. The pin should click into place and not come back out easily. It takes a little practice to get the hang of it, but not having any connections soldered directly onto the Arduino makes it a lot more reusable! Those 3 rows of pins are just a row of Ground, a row of 5V, and then a row for all the I/O pins. So the white wires are all on the bottom row (the input signals), and the black wires are on the top. Each row is labelled on the board: G, V, and S.
I wrote a simple library to interface with the Joystick firmware, and a sketch tailored to how I have my inputs setup and what I want them to do. The sketch interprets the toggle switches as momentary inputs; that is, it sends a short button-press event every time you toggle the switch, as opposed to "holding down" the button the entire time the switch is on. This design makes it work well with most of Elite: Dangerous' controls. In a future iteration I hope to make this all a bit more generalized and include a lot more functionality in the Joystick library. But for now, this works really well! 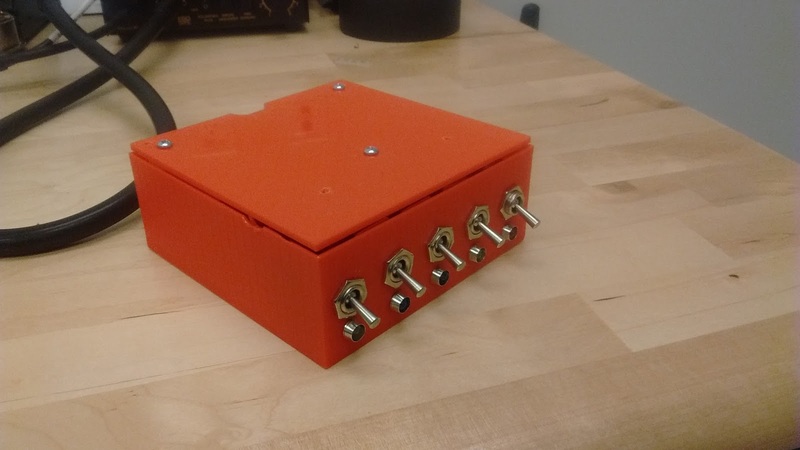 3D printing the project box sounded super cool, but I wouldn't do it again. It took too long, the resulting plastic is a bit weak for the job, and getting the hole placement just right was a pain. (and 3D printed parts don't take especially well to drilling) For my next iteration of this box I've purchased a pre-made project box. 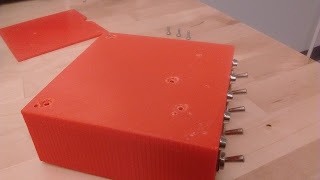 If I were to 3D print again: remember to put screw-holes and posts in! Mounting the LEDs was a bit of a problem, since the LED holders assume you're wiring them in place. I couldn't use their intended mounting setup, and had to just hot-glue them into place instead. This happened because the LED holders were back-ordered, and didn't arrive until late in the project. The Arduino Uno R3 + sensor shield is nice, but the total package is a bit big. I later discovered the Yourduino Robored, which has the same 3-row pinout as the sensor shield, but in a much smaller (and cheaper) package. I ordered a couple of these and intend to use them in future projects. One downside: they ship from Hong Kong and take a while to arrive. In the quiet of night (when I often play Elite) these toggle switches are loud enough to wake up and scare my housemate! I bought a bunch of rocker switches with LEDs already integrated for future use.